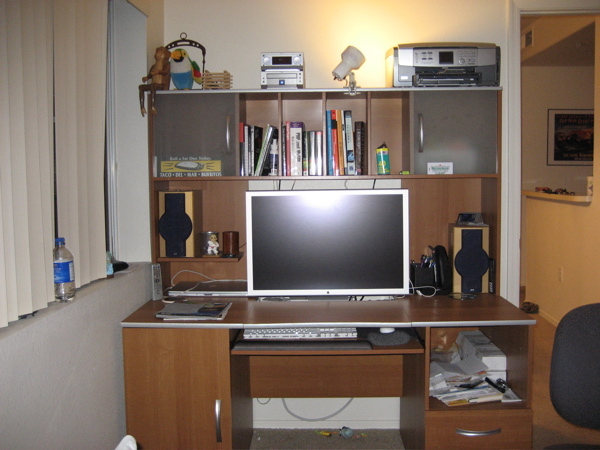 My pal, Mr. Gary Lee, has started a contest at his blog to see who has the best home workstation. I primarily work from home and I have a decent setup. I have a MacBook Pro Intel Core Duo 2.16 GHz with 2GB of RAM feeding my Apple Cinema Display 30″ LCD. My resolution? 2560×1600. I also have a wireless keyboard and mouse. My computer is connected to my JVC home stereo. The winner of the contest will receive a Motorola HT820 Bluetooth Stereo Headset. you won the wii and now you’re going after the bluetooth! . . . hahaha . . thanks for entering man! Great setup, i think you’re gonna win this one! Nice setup Nate. Those cinema displays are nice, but I could never put that much money into it. I would personally have gone for a few smaller screens, but that is nice. Good luck winning. wow.. very nice.. can’t say i can compete with that! My best rig was about… oh… 7 or 8 years ago. Twin 21inch CRT Sony monitors, big graphics cards, Yoke for Flight Sim, the worst graphics tablet you’ve ever tried to use. I loved that kit! c’mon guys . . bigger does not mean better even though it definitely helps! hahaha . . . . come participate in the contest and get at least a linkback from me 🙂 . . . .
WOW Nate – That’s a sick set-up. That screen looks Mad. Wow. That is impressive. Can I trade w/you? As expensive as they are, it really is an excellent value. It is so easy to get work done and I can be doing so many things at the same time. It has improved my efficiency so much that the work I have done has already paid for the screen several times over. honestly . . do you need sunglasses when you use that thing? now you got me with screen envy . 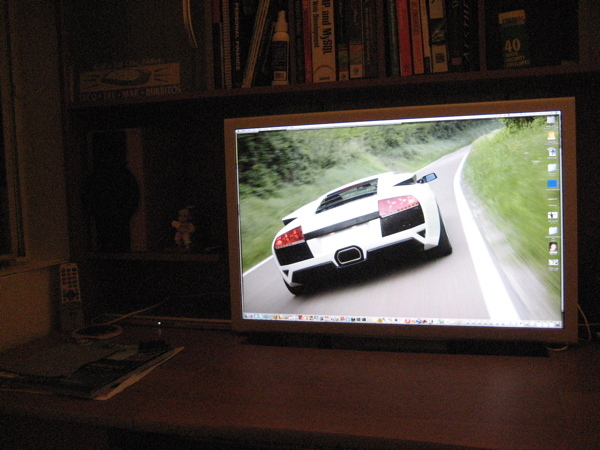 . . i have a 24″ iMac and it looks freakishly small now! And I thought my 22″ was awesome. Yikes! Dang, that is a beautiful setup. Very nice screen… asides from the Mac hehe j/k. 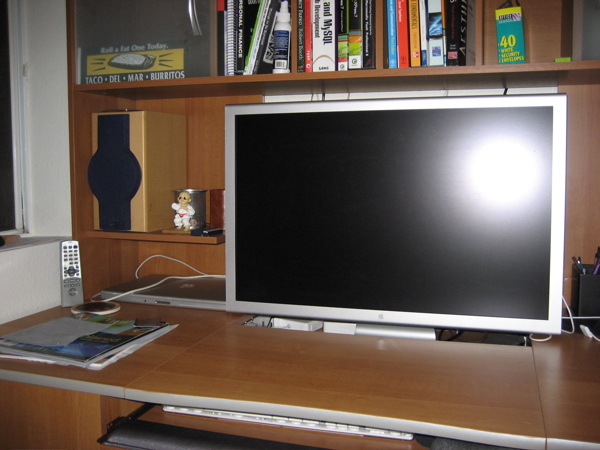 wow…my CRT could never compete with your monitor..hehe..